Available colors: OD, Black, White, Navy, and Khaki. 54" length which can be cut to size. 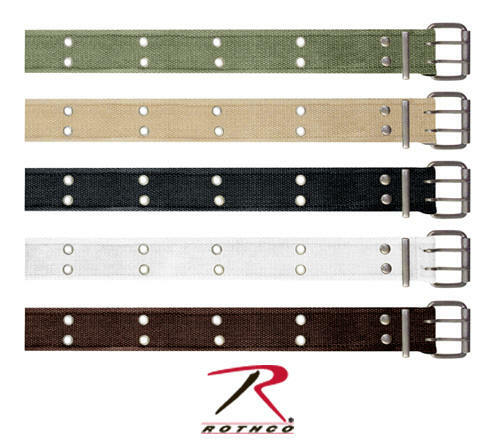 BUCKLE SIZE: .2165" x 2.2047" x 1.7322"
SIZE SMALL FROM BUCKLE 8 SET HOLE APROX 3" APART, 3" SPACE, 7 SETS HOLES 1" APART 3" SPACE TO END. SIZE MEDIUM FROM BUCKLE 10 SET HOLE APROX 3" APART, 2 1/2" SPACE, 7 SETS HOLES 1" APART 3" SPACE TO END. SIZE LARGE FROM BUCKLE 11 SET HOLE APROX 3" APART, 3" SPACE, 8 SETS HOLES 1" APART 3" SPACE TO END. WAIST SIZE = SMALL 35", MEDIUM 39", LARGE 43", X-LARGE 47"
TOTAL WEB LENGTH = SMALL: 39" MEDIUM: 43" LARGE: 47" X-LARGE 51"